The DiamondBack HD is constructed out of .100" 3003 alloy aluminum diamond plate and can support up to 1600 pounds on top of it, which makes it the toughest cover on the market. The cover includes twelve high-strength cargo cleats offer multiple tie-down points for securing cargo. It's available in two finishes, brite aluminum and black spray-on finish. Not only do they add a unique stylish look, but they both also act as a protective coat to help the cover maintain its looks for years down the road. The DiamondBack HD offers easy bed access and was created to prevent you from ever having to go through the hassle of climbing into the truck bed again. It features panels that can open from the front or the rear, giving you quick access to your valuables from any angle of the vehicle. Gas struts hold the panels in place for smooth opening and closing. 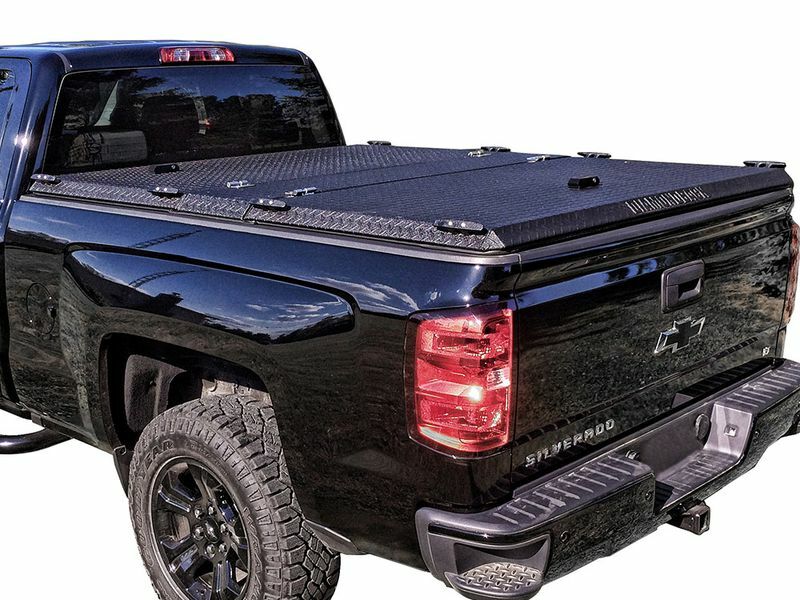 DiamondBack understands that security is one of the main reasons that people choose to buy a tonneau cover, so they made sure to take the security of this cover to the next level. Each panel has keyed lock handles with heavy duty hardware, just like a dead bolt. This should give you peace of mind that your valuables are safe and secure. Metal rods are use to lock the doors into place. On top of making the DiamondBack HD the most durable cover on the market, they incorporated a water resistant seal around the edges. A neoprene compression gasket sits between the bed rails and the tonneau cover as the main defense against the elements. The angled edges guide water away from the truck bed. Gutters in the center panel drain any water when opening the panels of the tonneau cover. 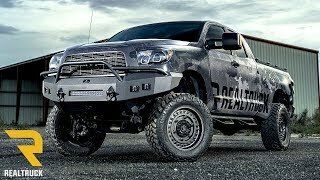 The DiamondBack HD is the strongest cover that DiamondBack has to offer and it goes above and beyond the rest of the competition. It's without a doubt the most heavy duty cover on the market and it will keep your valuables safe and dry. It's available with a brite aluminum finish or in a black spray-on finish. The DiamondBack HD is constructed out of .100" 3003 alloy aluminum diamond plate and can support up to 1600 pounds on top of it which makes it the toughest cover on the market. The cover includes twelve high-strength cargo cleats offer multiple tie-down points for securing cargo. It's available in two finishes brite aluminum and black spray-on finish. Not only do they add a unique stylish look but they both also act as a protective coat to help the cover maintain its looks for years down the road. The DiamondBack HD offers easy bed access and was created to prevent you from ever having to go through the hassle of climbing into the truck bed again. It features panels that can open from the front or the rear giving you quick access to your valuables from any angle of the vehicle. Gas struts hold the panels in place for smooth opening and closing. 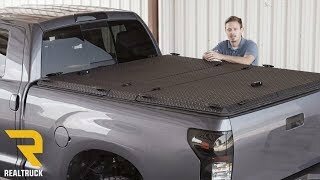 DiamondBack understands that security is one of the main reasons that people choose to buy a tonneau cover so they made sure to take the security of this cover to the next level. Each panel has keyed lock handles with heavy duty hardware just like a dead bolt. This should give you peace of mind that your valuables are safe and secure. Metal rods are use to lock the doors into place. On top of making the DiamondBack HD the most durable cover on the market they incorporated a water resistant seal around the edges. A neoprene compression gasket sits between the bed rails and the tonneau cover as the main defense against the elements. The angled edges guide water away from the truck bed. Gutters in the center panel drain any water when opening the panels of the tonneau cover. DiamondBack HD tonneau cover clamps on to the bed of the truck. No drilling is required.